FILE - U.S. President Donald Trump speaks by phone in the Oval Office at the White House in Washington, Jan. 29, 2017. The U.S. and French presidents, Donald Trump and Emmanuel Macron, agreed in a phone call Wednesday on "the need to take action to hold Russia accountable" for its use of a nerve agent in the attack in Britain on a former Russian spy and his daughter, the White House said. In a statement, the White House said Trump and Macron "reiterated their solidarity with the United Kingdom in the wake of Russia's use of chemical weapons against private citizens on British soil." Britain has blamed Moscow for the poisoning of Sergei Skripal and his daughter Yulia in the British city of Salisbury earlier this month. They remain in critical condition. Moscow has denied involvement in the incident. Britain expelled 23 Russian diplomats in retaliation for the attack and Russia ordered the expulsion of the same number of British envoys. 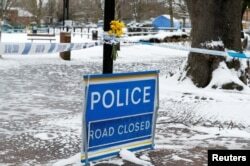 Flowers are left at the cordon near the tent covering the park bench where former Russian intelligence officer Sergei Skripal and his daughter Yulia were found poisoned, in Salisbury, Britain, March 19, 2018. Trump's agreement with Macron for the need to take undisclosed action against Russia for the chemical weapons attack came a day after Trump called Russian President Vladimir Putin to congratulate him on his election victory last Sunday. According to the White House, however, Trump did not mention the attack on Skripal and his daughter in his conversation with the Russian leader. The White House said Trump and Macron also discussed how the U.S. and Europe "might come together over tariffs," in the wake of Trump's imposition of new levies on steel and aluminum imports from foreign countries.